Bloomsbury USA Childrens, 9781681190303, 40pp. From the team behind the gorgeous What Will Hatch? comes a companion book all about seeds and the plants that grow from them--and featuring four pull-out gatefolds. Awards for What Will Grow? Jennifer Ward and Susie Ghahremani are the team behind Bank Street Book of the Year What Will Hatch? and the popular parenting book I Love Dirt! : 52 Activities to Help You and Your Child Discover the Wonders of Nature, which has been featured in Parenting and Real Simple magazines and on NPR. 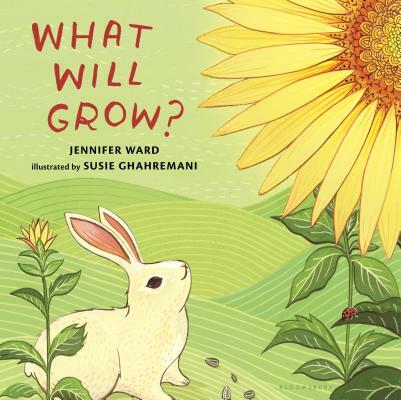 Jennifer Ward has authored several picture books, including her recent Feathers and Hair: What Animals Wear and Mama Built a Little Nest. Jennifer currently lives in southern Illinois, where she writes full-time. Susie Ghahremani is an award-winning illustrator, exhibiting artist, and designer of the popular and whimsically illustrated gift brand boygirlparty®. She is a graduate of the Rhode Island School of Design (RISD), and she lives in Southern California. "An elegant interactive design and serene illustrations." - Publishers Weekly on WHAT WILL HATCH? "Ghahremani’s picture-book debut features incredible hand-lettering and muted, textured tones . . . [T]hey work well in this quiet nature story . . . Science for the very young is done best through joyous learning; education will certainly hatch from these pages." - Kirkus Reviews on WHAT WILL HATCH?